The following document is part of a series produced by the Department of Homeland Security's Office of Cyber and Infrastructure Analysis (OCIA) on failing infrastructure. Though they do not bear any protective markings, the documents are not released publicly. The U.S. Department of Homeland Security/Office of Cyber and Infrastructure Analysis (DHS/OCIA) produces Critical Infrastructure Security and Resilience Notes in response to changes in the infrastructure community’s risk environment from terrorist activities, natural hazards, and other events. 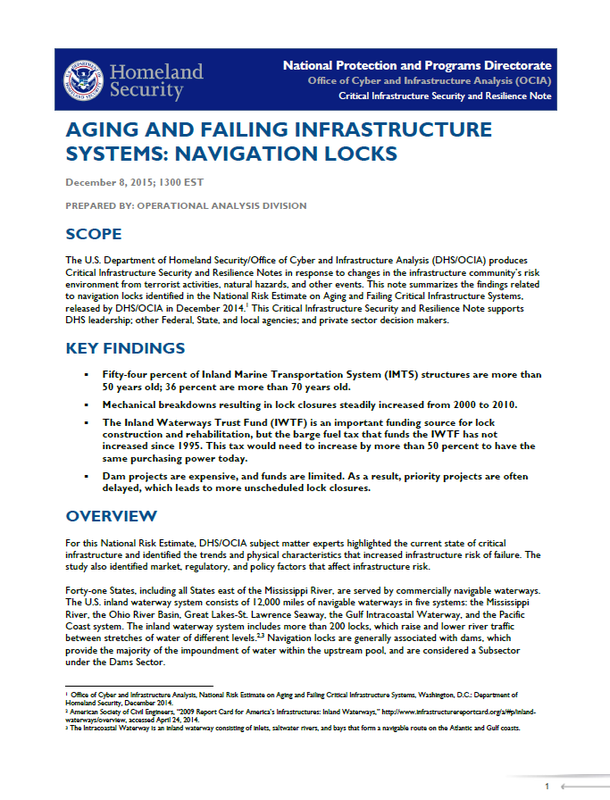 This note summarizes the findings related to navigation locks identified in the National Risk Estimate on Aging and Failing Critical Infrastructure Systems, released by DHS/OCIA in December 2014. This Critical Infrastructure Security and Resilience Note supports DHS leadership; other Federal, State, and local agencies; and private sector decision makers. Fifty-four percent of Inland Marine Transportation System (IMTS) structures are more than 50 years old; 36 percent are more than 70 years old. Mechanical breakdowns resulting in lock closures steadily increased from 2000 to 2010. The Inland Waterways Trust Fund (IWTF) is an important funding source for lock construction and rehabilitation, but the barge fuel tax that funds the IWTF has not increased since 1995. This tax would need to increase by more than 50 percent to have the same purchasing power today. Dam projects are expensive, and funds are limited. As a result, priority projects are often delayed, which leads to more unscheduled lock closures. Most locks are designed to last for 50 years, but 54 percent of IMTS locks are more than 50 years old, and 36 percent are more than 70 years old. Many of these locks are in need of repair and replacement, and some lack basic maintenance. Concrete is crumbling at some locks, and some have not been painted in 25–30 years, increasing the risk of corrosion. steadily increased since 1992. Fewer than 7,000 unscheduled closures occurred every year before 2000, and more than 7,000 occurred every year after 2000, peaking in 2008 with 13,250.